For the food enthusiast on your Christmas gift list, Posh Beauty Blog has rounded up some incredible items that foodies will love. This holiday gift guide is especially for those who enjoy crafting and eating culinary delights. 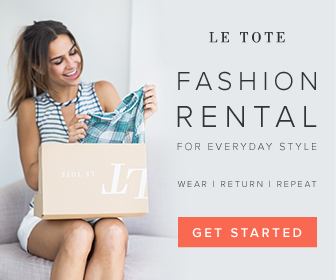 It’s Posh Beauty Blog's Holiday Gift Guide – Food Enthusiast Edition! Lolli and Pops, the purveyor of sweets, recently launched curated gift boxes for every gifting category (mom, best friend, your SO, boss). The sweets are hand selected by the curation team with flavors from all over the world, and the boxes come beautifully packaged and shipped so you don’t have to do anything but click. Gorgeous, chic, delicious an perfect for foodies! Rise to any occasion with Rise Baking. If you have a baker or an aspiring baker on your Christmas list, give the gift of Rise Baking, a monthly baking subscription service that ships premium ingredients with original recipes directly to your door. The process is simple. Each month the receiver will choose recipes that suit their taste. Then, their monthly baking box will arrive fully stocked with pre-measured and color coded ingredients making the baking process simple. Rise takes the intimidation and hassle out of baking with results that will have anyone baking like a pro. All recipes are "from scratch" never mixes! Any sweets lovers on your holiday gifting list? Mrs. Fields. Has a selection of treats to choose from that are guaranteed to satisfy even the most discerning sweet tooth on your list, Mrs. Fields’ nostalgic cookies, cakes, chocolate covered pretzels, brownies and more will be a fan favorite among friends, family and co-workers. I love the Special Delivery Mailbox which comes with 36 Nibblers bite-sized cookies, 4 frosted cookies and 4 butter caramels. Aervana is relatively new to the market: the first of its kind, one-touch, luxury wine aerator. All you have to do is uncork a bottle of red (works best with wines you would normally want to let “breathe” for awhile), place your Aervana on the bottle, push the button on top, and— voila— your wine is perfectly aerated, while it’s served into your glass by your own, personal, little tap. It’s a very interactive, perfect-for-entertaining gift that I think your readers would appreciate. Innovative and stylish without breaking the ban, it’s a tool that actually works for wine enthusiasts and is simply new and a lot of fun for everyone else. These days, the ongoing gift of choice for foodies is the subscription box. Wecheesy.com is the subscription box for the cheese lover! Each month, We Cheesy sends subscribers a box of 4 to 6 cheese-related items. There is always a block of cheese plus additional edibles and a surprise gift. Surprises include items such as comic books, party straws, buttons, etc. This is part of what makes We Cheesy special. We Cheesy is different from other cheese-of-the-month clubs in that it aims to make the pleasure of enjoying good cheese accessible to everyone. It’s joyous, family friendly exploration of cheese and cheesy foods and far from stuffy. For the holidays, Maille presents two of its exclusive Mustards on Tap in a new set: refillable 4.4 oz stoneware jars of the irresistible new limited edition Truffle and Cep Mustard and the best-selling Chablis White Wine and Black Truffle Mustard, plus a signature wooden mustard spoon, in a black gift box. If I ever splurge on mustard, it's mustard from Maille The Dijon Duo is available online at Maille.com. The mustards are also sold individually. I just discovered ceramic knives. And they are perfect for the foodie or cook on your gift list. 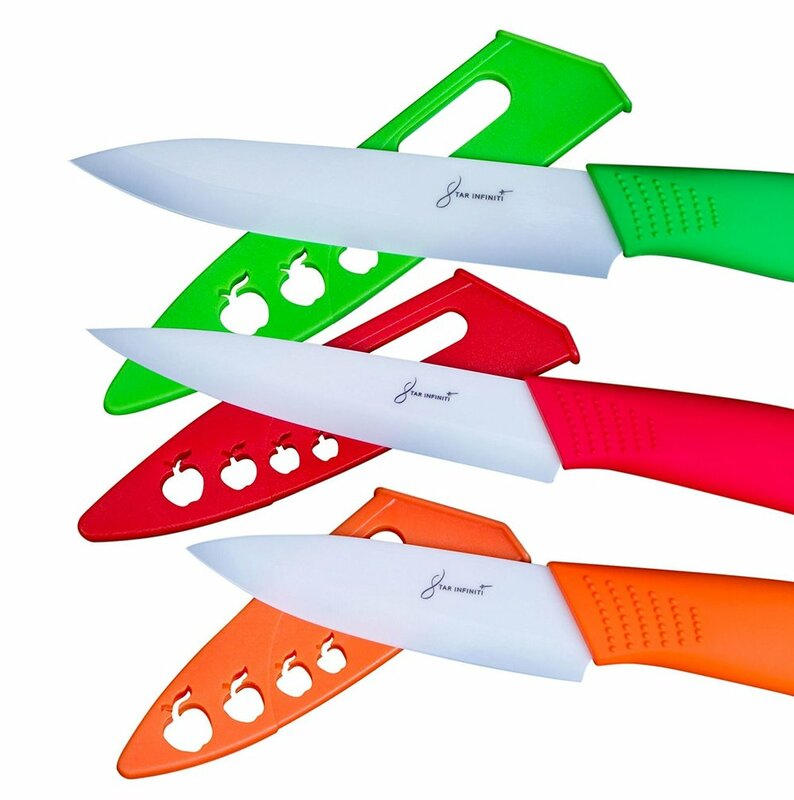 This 6-piece ceramic knife set comes in three colors (red, orange, green) with blade covers for safety. They are easy to use, have nice sharp blades, and are easy to clean. Most importantly, I don’t cut my fingers when reaching for them in the silverware drawer. The bright colors help me find them quicker too! 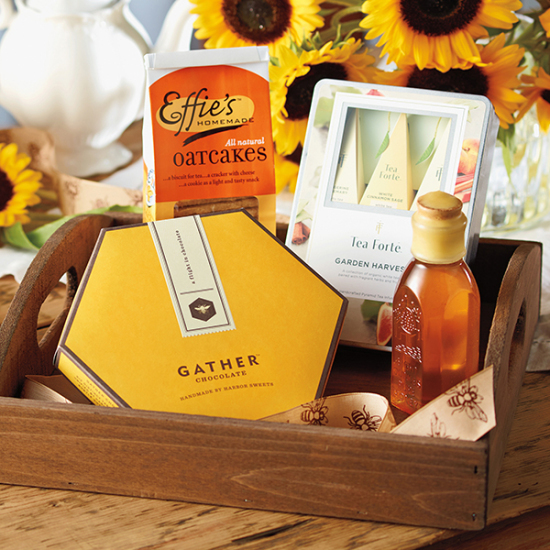 The foodie in your life will love this handcrafted product from Chattanooga, Tennessee. Hoff & Pepper is a tasty hotsauce handmade from a few simple ingredients [now including locally sourced chiles!] and hand labeled with locally printed letterpress labels. They just wonseveral important hot sauce awards - 1st Place "Louisiana Style" and2nd Place "Jalapeño Style” at NYC Hot Sauce Expo and 3rd Place"Pepper Blend" at the World Hot Sauce Awards. You can buy them online and at several local Chattanooga retailers as well as at Brooklyn’s Heatonist. Chocolate maker Harbor Sweets recently launched a new line of gourmet chocolates called Gather, infused with wildflower honey that are not only delicious; they are wrapped in a beautiful yellow honeycomb gift box that is perfect for gift giving. There’s more to this pretty box too. It’s mission-inspired, supporting a support a critical environmental cause, protecting the honeybee and pollinators. Gather is a flight of six distinct taste experiences. Its six chocolates include: three truffles Caramelized Honey, Pomegranate Molasses, and Sour Cherry, and three enrobed in dark chocolate: Cashew Caramel, Coconut Cluster and Sesame Crunch. You can also check out the Gather Tea Set - a great gift idea for the tea lover, visit harborsweets.com and use code GATHER4FUN through 12/14 to save 10% off your shipping. By swirling The Wand in a glass of your favorite wine, you will remove those pesky things that can cause headache, flush, and a stuffy nose. The Wand is the only product on the market that removes histamines, as well as sulfites, ensuring the best wine drinking experience out there. This is a perfectly unique gift for wine lovers everywhere.